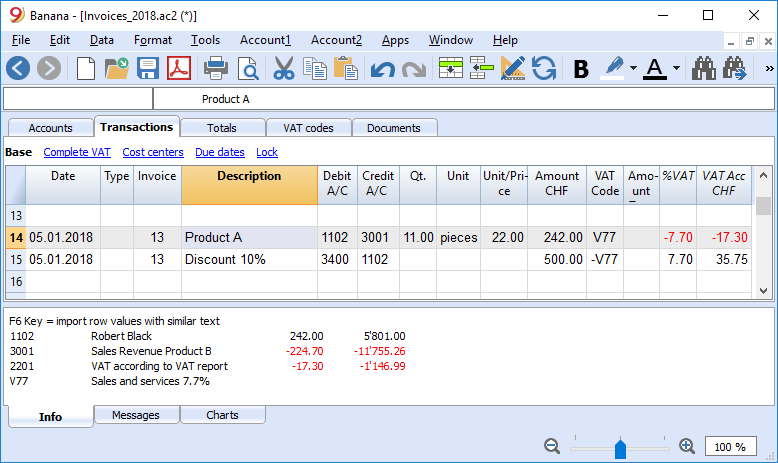 In Banana Accounting 9 software, invoices to be sent to customers are generated based on the accounting transaction, issuing the invoice. This method differs from all other accounting programs where, as a rule, the invoice is created prior to entering the accounting transaction. In the Chart of Accounts (Accounts table) indicate an account for each customer, with the address and other data you might need. In the Transactions table enter the rows of transactions, that will constitute the rows of your invoice. Indicate the date of transaction and the invoice number. Those values will have to be repeated for other rows appertaining to the same invoice. Indicate the debit account of the customer. Indicate the accounting counterparty (Sales account, Consulting or other) and the amount. A VAT code may also be used to indicate the percentage applicable to the transaction. The Print invoices command (Account2 menu > Customers) will display a preview of the invoice, for which the data of the Accounts table and the invoicing rows of the Transactions table are used. In which file should you manage the invoices? The entries of the invoices are registered directly in the accounting file of the company. This method is recommended if invoices are to be registered in your accounting when they are issued. There is a direct link between the entries to the accounts and the content of the invoices. Entering records and printing your invoices directly will prevent possible errors in carryover of information. Accurate knowledge of accounting is a prerequisite for establishing invoices. With the simple Copy/Paste you can easily create similar invoices. For example in order to create similar invoices for all members of an association, you can create the first invoice rows and then you can just change (or paste) the account number of the different members. If necessary, you can create rows in Excel and paste them into Banana. In the File menu -> File and accounting properties... you can setup your company's address and data, which will be used as the header of the invoice. In the Accounts table, you can setup your clients/suppliers register and manage your clients settings via the Account2 menu -> Customers -> Settings. Additional columns are also available if you require more detail (Quantity, Price, Unit) and can be activated via the Tools menu -> Add new functionalities... command -> Add Items Columns in Transactions table. Same process for the Type column: if not displayed, use the Data menu -> Columns setup command. To use the company logo on the invoice or on the print, please refer to the paragraph "Logo on the invoice or on the print" of the Documents Table page. If you still don't have your own accounting file you can create an accounting file with the New command from the File menu. You will find some preset templates with clients/suppliers register. The accounting types that support the creating of invoices are the Double-entry accounting and the Income & Expense accounting (both can be applied - or not - with the VAT and multi-currency options). A new file is created, completely separate from the accounting file, where in the Chart of Accounts only the accounts for managing the clients and those necessary for the invoicing are being entered. You then enter the transactions for your invoicing. Invoices are registered only when cash settled. The amount is only entered in the accounting file when the invoice has been paid. A segregated management of invoicing is required. As in the case of membership fees for an association, for instance. Download the invoices.ac2 file template, open it and adjust for your requirements. Alternatively, you may start from any existing template and adapt it for the use of invoices, as indicated earlier. The invoices's date is reported in this column. All rows appertaining to the document must report the same date. In the Type column, rows can be definded as a specific line, for totalisation or term of payment, for instance. Refer to DocType column page for examples. You can enter the product quantity. If it is not visible, you can add this column using the Tools menu -> Add new functionalities... command -> Add column Quantity in the Transactions table. You need to enter your unit price referred to the service or good. The program will the automatically calculate the total amount based on the quantity enter in the Quantity column. As already mentioned above, in order to create (and then print) invoices, you need to have the Address view visible in the Accounts table. In the Address view there are several columns related to the customer data: Name, Address, Tel, .... one of these columns is the Language column. If the Language column is empty, the program uses the file creation language to print invoices (File menu -> File and accounting properties -> Other tab). If there is a specific language code in the Language column, the program uses the language indicated for printing invoices of that specific client. In this way, invoices can be printed in different languages for different customers. 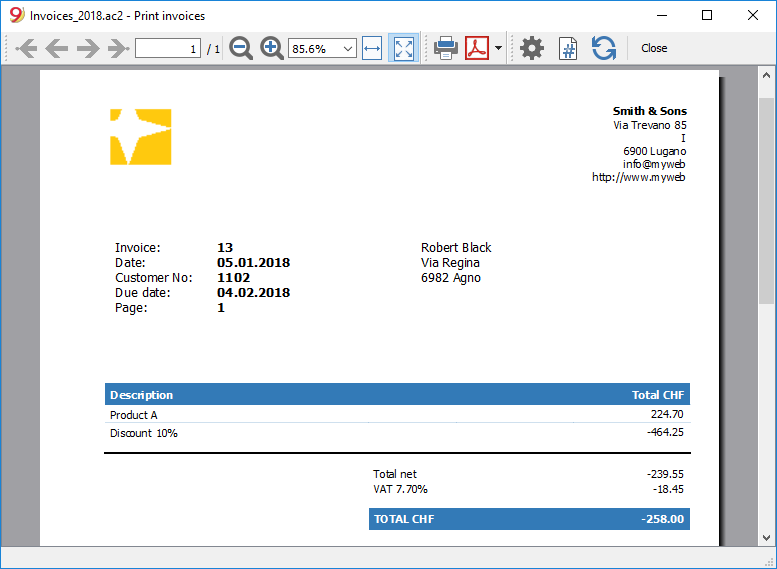 It is also possible, for each language, to set up predefined texts that will be displayed at the end of the invoice, for example greetings or bank details (for more information see the Print invoices page). Useful if you register with VAT on cash received or when you want to exclude invoice details from balance sheet accounts.